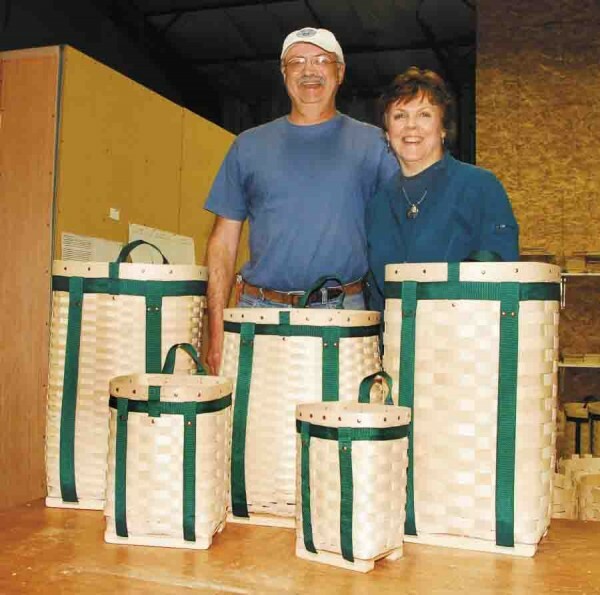 Kurt and Kathy Cressey pose with their various baskets in their Orrington production facility. For Kurt and Kathy Cressey, the careful development of their business has necessitated thinking outside the box — or, as they’d say, thinking outside the basket. Their efforts have resulted in earning them the Small Business Administration’s Micro-Enterprise of the Year Award. The Cresseys both worked at DeLorme Mapping Company for 10 years, but when their daughter came along in 1995, they decided they wanted a business where she could get off the bus every day and find her parents waiting for her. They decided to run a little general store, and found one in the Pine Tree Store in Grand Lake Stream, a seasonal crossroads for hunters, fishermen, campers and snowmobilers. The store closed every October after fishing season and reopened in January for the snowmobilers, so they soon decided they needed something to supplement their income and keep them busy. About that time, someone offered to sell a small business to them — making pack baskets. The idea just seemed right, so they bought the business, but they had no idea what they were doing. “We slowly ran [the business] down in the process of learning how to make baskets, and then slowly but gradually built it up,” Kurt said. Pack baskets have long been used as carry-alls, from Native Americans to modern-day fishermen. The Cresseys hand-make their baskets from strips of maple veneer that are first soaked in water and then tightly woven. After drying, the slats are tamped down even tighter, top strips are riveted on, and web straps are added. During the store’s seasonal shutdown, the Cresseys transformed it into a basket factory: soaking wood in the basement, assembling baskets in the store, and drying them in the converted walk-in cooler. But in three months, they quickly had to convert the store again to handle the snowmobiling crowd. “It was creative, but inefficient,” said Kathy. “It was exhausting,” added Kurt. They couldn’t make baskets fast enough. With their daughter about the enter high school, the Cresseys knew it was time to go to the next level. She wanted to attend John Bapst Memorial High School in Bangor, so they bought a house in nearby Orrington. Then they found ample rental space at the Dysart’s station on Route 15 in Orrington, less than three miles from home. A loan from Bangor Savings Bank enabled them to renovate the space, construct a drying room, and purchase $25,000 in wood — a huge order that saved them lots of money and provided them with a major supply. Until recently, almost all of their business has been wholesale, with Maine-based retailers such as Indian Hill Trading Post, Willey’s and L.L. Bean. Now they’re looking for online retail sales; they’ve established a Web site and have hired a marketing agency to help them grow. With their days entirely dedicated to making baskets, they’re on a roll. They’re building an inventory — something they’d never been able to do — and are learning new ways to do business. They’re excited about the SBA award, but Kurt says they aren’t seeking recognition; they’re just trying to make a living doing something they enjoy.